Cook Central serves as a public landing page for all the county’s open spatial data and interactive mapping apps and makes it easier for partner agencies and local governments to access data. On most Tuesday nights in downtown Chicago, a group of “hactivists” gathers to work on making their city a better place to live. They are designers, web developers, academics, journalists, policy wonks, and concerned citizens. At one such Chi Hack Night event, Cook County GIS developer David Treering and senior GIS analyst David Arfa debuted Cook Central, an open data hub built to support Cook County—home to 5.2 million residents. Treering and Arfa work in the GIS department of the Cook County Bureau of Technology and are part of the team behind the Cook Central hub. The creation of Cook Central was bolstered by strong support from Cook County board president Toni Preckwinkle, who wanted a way for government and citizens to share maps, apps, and data. While Cook Central serves the civic tech community, Treering said the site also meets two other important objectives: it creates easier data access for partner agencies and local governments, and it is a public landing page for all open spatial data and interactive map apps. The Cook Central hub features 125 datasets on the environment, transportation, boundaries, land records, places of interest, and more. It provides access to high-resolution aerial imagery of the county. Available interactive mapping apps include the county’s property portal, municipal boundary changes, economic and demographic data, a government facility locator, and taxing district information. Visitors can find information on public health, social services, and economic development. Developer resources link to APIs and examples of apps built using Cook County’s open data. 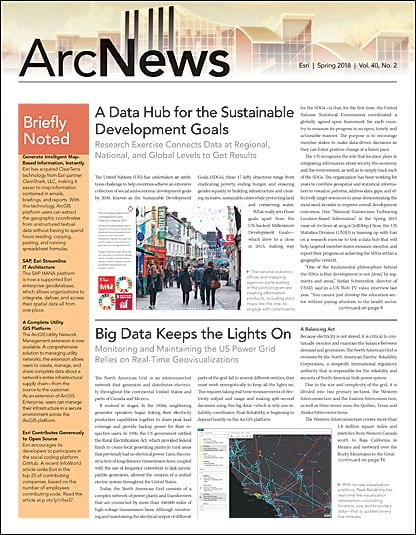 At a recent Esri User Conference, the Cook County GIS team saw the pioneering hub work done by the City of Los Angeles and learned about ArcGIS Hub, a two-way engagement platform that connects government and citizens. This inspired the team to transition the county’s existing open data site into a hub that provides access to data, apps, and maps and helps put data to work on policy initiatives that impact the public. 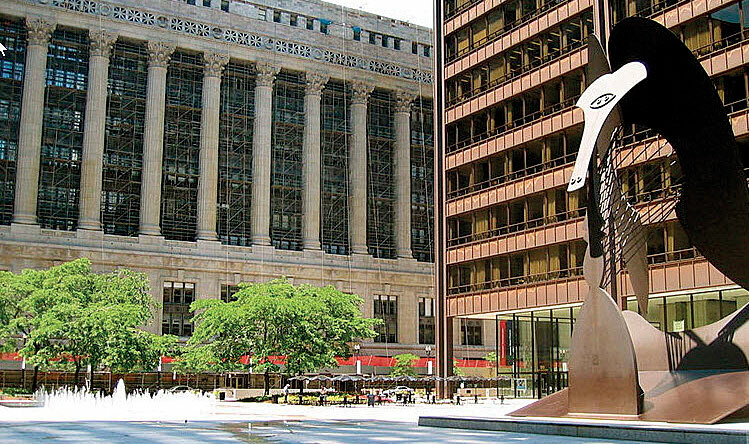 For Cook County, hub implementation was straightforward. Using the default styles and design from ArcGIS, the team produced a clean, modern interface. It used Esri’s online ArcGIS documentation as a guide for customization. The team translated its existing process for maintaining data in ArcGIS Online into Cook Central maintenance without any extra overhead. 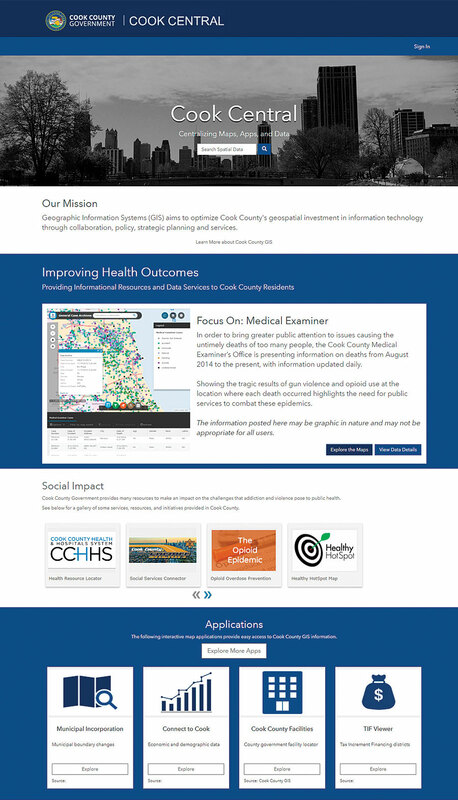 Cook County built individual landing pages for each open data category, such as Boundaries and Districts, Transportation, and Places of Interest. These themed pages each feature a popular dataset or highlight an app that uses data from the category, providing greater context for the datasets than simply browsing by tags. Many municipal governments in Cook County do not have the capacity to collect and maintain their own GIS data. They had to request critical information—such as planimetrics, property boundaries, and current imagery—from the Cook County GIS department. Now, Cook Central provides a self-serve solution to access current and historical data. This is significantly reducing the amount of time the GIS team would otherwise have to spend on fulfilling data requests. Most of the mapping apps currently available on Cook Central—including those for viewing highway construction projects, finding good fishing lakes, or exploring social services—were created by the county’s GIS department using the open-source Configurable Map Viewer template and ArcGIS Server map services. The apps are used by internal county offices and departments in their daily workflows, providing services and resources to Cook County residents and businesses. Citizens can also access and use the apps to be better informed about services and activities dealing with property, business, transportation, taxation, recreation, and more. A current effort of Cook County is to improve residents’ health outcomes by providing them, as well as service agencies, with informational resources and data services. Cook Central spotlights the Cook County Medical Examiner’s office, for example, to bring greater public attention to gun violence and opioid deaths since 2014. The Cook County GIS team used Web AppBuilder for ArcGIS to create point and hot spot maps that display medical examiner case records. The maps are featured on the Cook Central hub, identifying the location and number of such deaths to underscore the need for preventative public services. “It is expected that having a place online to inform and begin conversations about important policy initiatives will increase community engagement and improve how Cook County delivers services for residents and businesses,” Treering said. While Cook Central is already freeing up information for local governments and agencies, it is also expected to satisfy area journalists and researchers. Typically, when someone needs data from a county agency, such as the medical examiner’s office, that person has to file a Freedom of Information Act (FOIA) request. But Cook Central gives the public access to many important datasets, which should reduce FOIA requests, save county staff time, and increase transparency. With ArcGIS as the platform for Cook Central, there is a direct link to the county’s ArcGIS Online content. Instead of having to upload static shapefiles, as was done with the original Cook County open data site, Cook Central points directly to county services based on data replicated from the county’s production database. Cook Central also makes it easier for the county to share imagery services without needing to extract raster tiles and send them to people upon request. Explore Cook Central and all that the engagement platform has to offer. Housed within the Bureau of Technology, Cook County’s GIS department supports and promotes GIS initiatives throughout the county’s many departments and agencies. The GIS department is responsible for developing, maintaining, and providing access to the county’s authoritative spatial datasets for the 13 offices of elected officials, 135 county municipalities, and 5.2 million residents. This enterprise service department provides custom app development and mapping services to the county clerk, assessor’s office, forest preserve district, public health department, homeland security and emergency management agencies, animal control, department of highways and transportation, building and zoning, and more, to improve operational efficiencies and enhance decision-making on important policy initiatives.